This one, like so many others before, took him back to Hallow Hill during the deep winter, before the Blood Plague came. The whole House came together and fires would be lit in the hearths as cousins and uncles would tell their tales of gallantry from the previous year. They would speak of exploits at the Bridge, a narrow pass through the vast mountains separating the east and the west, or across the Skipping Stones, a series of islands that bridged the gap between the Twin Cities that looked at one another over the Sea of Stars. Kevan, his cousin and Thegn of North’s End, was only a year older but already faced pirates in the Stones and gained renown among the Freeholds and Halls there. They would toast him and beautiful women would flock to his bed. Then there was Jacen, his father’s youngest brother, called the Scourge of Tallendale. Every year he would ride down the brigands who raided along the Bridge in the name of Halloway. His coursers were the most magnificent animals in the kingdom, everyone said. But inevitably the dream would spin out of control and she would wither and die like she had after he’d been born. Like Kevan and Jacen, the Blood Plague rose within her during the pregnancy. She lived just long enough to birth him in a bed full of blood. His father always spoke of how she died calling out his name. He woke to the sensation of being kicked. It was not a gentle nudge but neither was it meant to injure. Paul woke slowly, the world of dreams melting away much like ice during spring. The first thing he became aware of was the pain. His left arm felt like it had been dipped in boiling oil. Every move of his hand or arm sent throbbing, sharp pains into him where the splinters of his shield tore through his mail and padded jacket. His shoulder felt odd and he discovered he could not raise it. It was stuck, jammed against something. It hurt to move and he groaned from the pain. “So you aren’t dead after all,” said a voice that seemed only half-real to him as he curled up tighter into a ball. The sun was up; he could feel it through the bush’s brambles. It was a fading sun however and he knew it must be late in the day. He’d always been able to tell the time without even opening his eyes, but he knew many useless things. A Calling of nothing, he thought. Just like father said. “Can you move? Hello?” The voice was young. At first he thought that Jack had found him. He would have been undone then, his shame complete. Word would travel back to his father and that would be the end of him. No noble could stand a coward and his father least of all. He would name another successor, Loukas perhaps. But my uncle is dead. “Jack?” he asked, slowly opening his eyes. Beneath the shrub, the world was cast in shadow and shade and Paul was happy for it. Even the small amount of sunlight that came through made his eyes burn and tear up. There was someone standing over him. The first thing he saw was a pair of leather shoes that looked well worn and soft. They were low with laces across the top that wound up the ankle and calf. Not Jack then, he thought with some relief. “Eh?” the voice said again, and this time he knew it was a girl. He blinked again and his vision began to clear. Looking up, he saw she wore a simple woolen dress that was patched and dirty. She wore no stockings beneath and where her ankles showed her skin bore bramble scars both old and new. When he finally saw her face, he stared. She was his age at least, perhaps older, with straw colored hair that was darker near the root. Her face was pinched, her dark eyes narrow and suspicious. A long nose swept gently upward at the tip just above a small mouth that seemed used to scowling. Freckles dotted her cheeks, some in thicker patches, some in lighter ones. Getting him out from under the hedge proved to be harder than he’d imagined, making him wonder how he’d managed to get into it in the first place. She pulled at him, jarring his shoulder and causing him to cry out in pain. Then she accidentally touched the wounds on his arm. He fell into silence then, his anger abated. They eventually found where he was snagged and she pulled his belt knife. For a moment he froze in terror but she only cut the ensnaring branch and with his help, pulled him free of the hedge and onto soft grass. 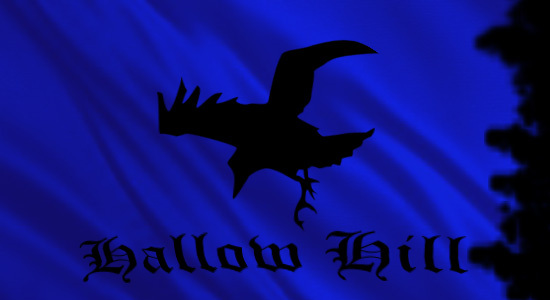 This entry was posted in Fantasy, Original Fiction and tagged Fantasy, fiction, Hallow Hill, The Saga of Aranor, Thegn. Bookmark the permalink.